My host Madre in Cuernavaca, Mexico would make pozole for us with hominy corn. This hearty stew has a special place in my heart as it reminds me of living in Mexico. Corn is a sacred plant among the Aztecs, so many Mexicans eat pozole on special occasions. 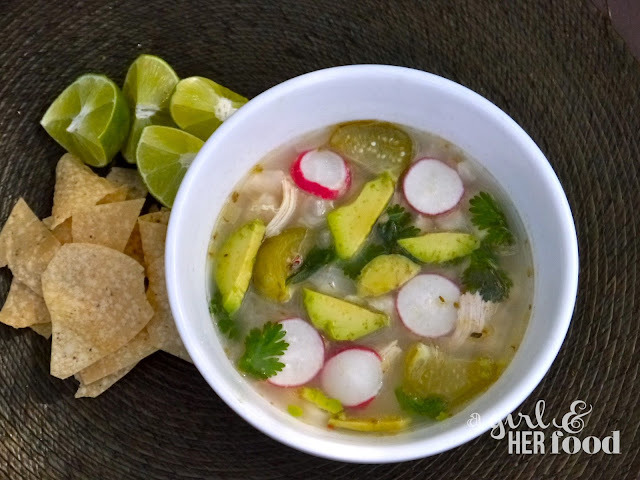 Traditionally the stew is prepared with pork but I prefer the lighter taste of chicken and it's faster to make, the staple ingredient to any pozole is hominy corn. Make sure you have your chicken prepared beforehand. If not, you can buy a rotisserie chicken breast from your local grocer. Heat olive oil in a saucepan over medium high heat, add the onions, garlic, oregano, cumin, seasoning and crushed red peppers. Cook for about 2-3 minutes, stirring occasionally. Add the tomatillos and cook for about 5 minutes, stirring occasionally. Add the chicken broth and hominy; bring to a boil and cook for about 8-10 minutes. Add the shredded chicken and cook for about 3 minutes or until the chicken is heated through. Remove the saucepan from the heat. 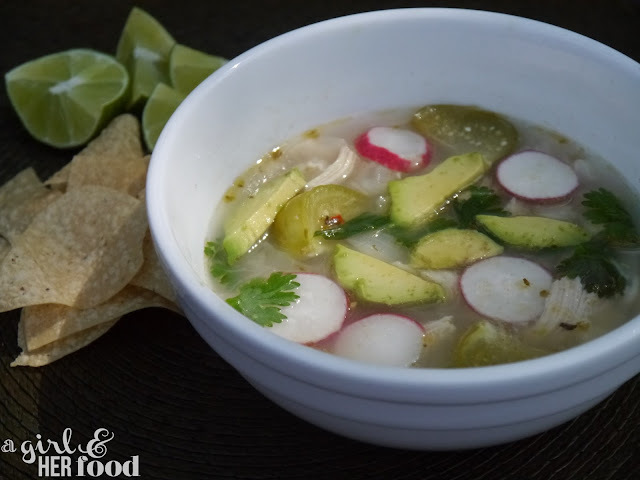 Use a ladle to pour the pozole into a bowl. Squeeze fresh lime juice and add all the garnishes. Serve the pozole immediately. My husband likes to break the tortillas chips into the pozole. Enjoy! Ok. Your blog is the bee's knees. So excited to be a new follower! Thanks for your friend request on FoodBuzz! !